Mark Herm (known online as "Dipthrong" or "shipp itt") is one of the most successful online tournament players in the world. At only 23 years of age, Herm has won the PocketFives.com Triple Crown, is the fifty-fifth ranked tournament player in the world, and is one of the leading posters at forums like PocketFives and TwoPlusTwo. Some of Mark's notable achievements include winning two major Sunday poker tournaments on the same day, racking up over $2,000,000 in total online winnings, and adding on another $80,000 or so in live tournament winnings. Herm has also	been	ranked as	high	as the top fifty in the PocketFives MTT rankings. This article is going to take a look at Dipthrong's career, and we will list his major tournament scores. Also, we will provide you with Mark Hern's screen name at all of the major poker sites, so you can sit down and test your luck with this tough tournament player. Herm also dabbles in live poker from time to time, but online tournaments are his primary focus. You can find Mark living at his home in Royersford, Pennsylvania. Mark Herm has had countless five-figure online scores, so we are only going to list his biggest tournament results here. In the summer of 2008, Herm enjoyed one of the hottest streaks ever recorded in online poker, as he won the Bodog Sunday $100,000, the Full Tilt Poker $750,000, the Sunday Mulligan at Full Tilt, and the PokerStars $250,000. In fact, the Bodog $100,000 and the Full Tilt Poker $750,000 wins happened to come on the same day! Mark has cooled off a bit since the summer of 2008, but he continues to rack up five-figure scores every month. As we mentioned before, Dipthrong has also started hitting the live tournament circuit. He has yet to achieve a level of success comparable to his online play, but has final tabled the Borgata Poker Open in January of 2008 for a $34,500 score, and also took tenth place in the Foxwoods Poker Classic in March of 2008 for $4,313. 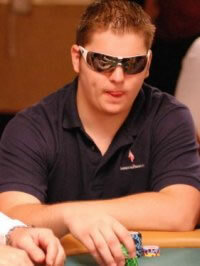 Keep your eyes peeled for Mark Herm on the live tournament circuit - it won't be long before he has a major win. Mark's favorite hand is 9-3 of spades. His favorite tournaments are Omaha Hi-Lo MTT's, and his favorite cash game is a $0.50/$1 Limit Omaha game. He would like to visit Philadelphia, Pennsylvania, and considers eating his profession.